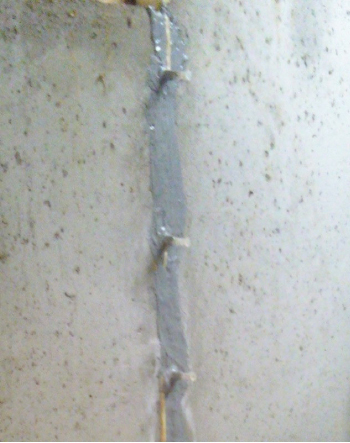 Poured concrete walls that area leaking at wall cracks, waterline, and sewerline penetration are common issues. When we seal a wall crack, waterline, or sewerline penetration we use a process called Emecole Injection System, details on the injections system are included on our web pages. The injection system is not typically used on block walls and each repair must be assed individually. Our pricing for repair of a standard 8 foot wall crack sealed with Emecole injection is $575.00, sealant of the waterline and the sewerline penetration with Emecole injection system is $375.00. These prices are standard and we reserve the right to price each repair on an individual basis. As a temporary repair you can use hydraulic cement from your local do it yourself store. It is best to apply the hydraulic cement when the leak is not actively flowing water, however it can be used in flowing water to help slow the penetration. See the product label for directions for mixing and applying hydraulic cement. Please note that this is not a permanent repair hydraulic cement is a rigid material and will re-crack allowing water to penetrate; again however it is a great tool for holding back the water until a professional arrives. To the right is a picture of a completed injection on a concrete wall.